The Western Massachusetts Chiefs of Police Association is contracted by the Municipal Police Training Committee (MPTC) to provide the Basic Reserve/Intermittent Training Program in Western Massachusetts. These classes as well as Reserve In-Service, Specialized Training and Refresher classes are offered in Berkshire, Franklin, Hampshire and Hampden Counties. Our main training facility for the Western Massachusetts Police Academy is located at Springfield Technical Community College (S.T.C.C.) located at 1 Armory Square in Springfield. Completing the Basic Reserve/Intermittent Police Academy is required before you can work as a Special/Auxiliary/Reserve/Part-time/Intermittent Police Officer. Currently the training consists of 372.5 hours and follows the curriculum developed by the MPTC. Classes are held on Tuesday and Thursday evenings, and all day on Saturday. Classes are offered in Springfield, at the Western Mass Regional Police Academy, and occasionally at satellite locations in Berkshire and Franklin counties. A minimum of 35 student officers is needed for a class to begin. In order for you to attend an academy, you must be sponsored by a municipal or campus police chief, a sheriff, or campus/hospital security director in the Commonwealth of Massachusetts. You must obtain this sponsorship yourself, and it does not guarantee employment with that or any other agency. NOTE: On lower left hand side of the outside of the envelope, mark "RESERVE PROGRAM"
The tentative dates of the Academy are generally posted on this website. Check this site frequently for updates on upcoming training and schedule changes. There is a list of frequently asked question below. If you still have questions, AFTER you have read these FAQ’s, please complete the contact form to contact us. 1. Get sponsorship approval from a municipal or campus police chief, a sheriff, or a campus/hospital security director in the Commonwealth of Massachusetts. 3. Submit a $500 bank check or money order (NO personal checks accepted) for tuition deposit along with the completed application. The remaining $1,300 of the $1,800 tuition cost is due on the first day of class. NOTE: On lower left hand side of the outside of the envelope mark "RESERVE PROGRAM"
5. Any questions pertaining to the above process check out the "Frequently Asked Questions" page and/or contact us here. The schedule of all upcoming classes is posted in the “Important Announcements” section at the right side of this page. Please take the opportunity to browse the FAQ section. There are many Frequently Asked Questions with full answers about the training in this section. If you still have questions you can contact the Western Massachusetts Chiefs of Police Association though our contact page. 3. Submit a $500 money order for tuition deposit with the completed application. The remaining $900 of the $1400 tuition cost will be payable of the first day of class. On lower left hand side of the outside envelope mark "RESERVE PROGRAM"
5. Any questions pertaining to the above process check out the "Frequently Asked Questions" and/or contact us here. The academy schedule of all upcoming classes is posted in the "Table of Contents" section at the right side of this page. Please take the opportunity to browse the FAQ section. There are many Frequently Asked Questions with full answers about the training in this section. If you still have questions you can contact Sgt. Mark Smith, Coordinator of Training or Chief Philip J. Adams (Ret.) Executive Director of the Western Massachusetts Chiefs of Police Association through our contact page. Take Exit 8 to Route 291. Get into the right lane. Take Exit 3, Armory Street. At the end of the ramp, go through the traffic light. Take first right onto Armory Street South. At the 3rd light, turn right onto Taylor Street. Take immediate left onto Federal Street. 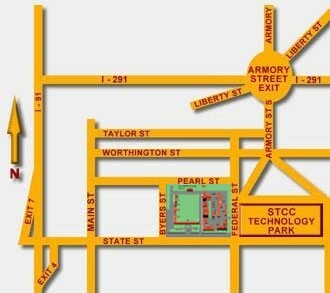 Go about 4/10 of a mile and turn right into STCC's main gate.